Australian scientific agency the CSIRO reports that a $12 million upgrade to its radio telescope, which will boost bandwidth from 128 MHz to 2 GHz, is almost completed. The Australia Telescope Compact Array, a set of six radio dishes near Narrabri in NSW, was touted by CSIRO chief executive Dr Megan Clark as leading the next generation of signal processing. The upgrade makes the Compact Array’s bandwidth sixteen times greater, and turns the instrument’s data stream into a torrent. “It’s like going from dial-up access to the universe to having broadband,” the CSIRO’s Australia Telescope National Facility (ATNF) assistant director Graeme Carrad said, adding that the upgrade allows eighty times more data to flow from the antennas to the rest of the system. “All this data could be captured, although astronomers may or may not choose to do so,” Carrad said. 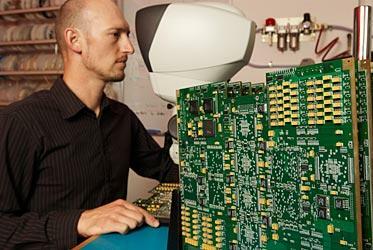 Thirty-two special processing boards, each with 26 layers and 4000 components, were designed and built by the ATNF for this project. According to the agency, the radio dishes and receivers that perform the initial amplification of cosmic radio signals remain unchanged, but almost every other piece of equipment the signals pass through has been changed. The increase in bandwidth makes the telescope four times more sensitive to faint signals, and cosmic objects will be able to be detected more quickly and travelling at a wider range of velocities, ATNF’s acting director Dr Lewis Ball said. “They’ll also be able to pick up new features in objects that have been studied before,” Ball said. Five radio observatories around the world have been sold offshoots of the new system. The Compact Array Broadband Backend (CABB) project feeds into the Australian SKA Pathfinder (ASKAP), a $3 billion telescope being developed by CSIRO which will comprise of 36 antennas, each 12m in diameter, and will be a pathfinder instrument for the full Square Kilometre Array (SKA). The seven year CABB project received funding under the government’s Major National Research Facilities program, and led to other improvements at the 64 metre Parkes dish in central-west NSW and the 22 metre Mopra dish near Coonabarabran, NSW.